Leeches and amphibians frequently interact with each other in nature, usually with the amphibian serving as food for the leeches, whether as eggs, tadpoles, or adults. Of course, the thing that most people know about leeches is their appetite for blood, and those that parasitise amphibians are no different. Most amphibians usually survive their blood-letting encounter with leeches (with some exceptions), but some leech can transmit blood-borne parasites and may be an additional source of stress for their hosts during unstable environmental conditions. While there have been some studies on interactions between leeches and amphibians, most of them have been on those found in freshwater environments, and less is known about the terrestrial species. Batracobdella is a genus of leech that is usually associated with amphibians, as denoted by their scientific name which basically translates into "frog leech". The study that I am discussing in this post focused on Batracobdella algira, a species of green leech found in Europe which has been found to feed on a wide range of different amphibians. Among its list of hosts are European cave salamanders. These cave salamanders are confined to southeastern France and Italy, and are unique among salamanders in that they lack lungs and breath entirely through their skin. Batracobdella algira is the only known ectoparasite of those secretive amphibians, and while there have been some records of leeches on these salamanders, next to nothing is known about their ecology or the impact they might be having on their hosts. 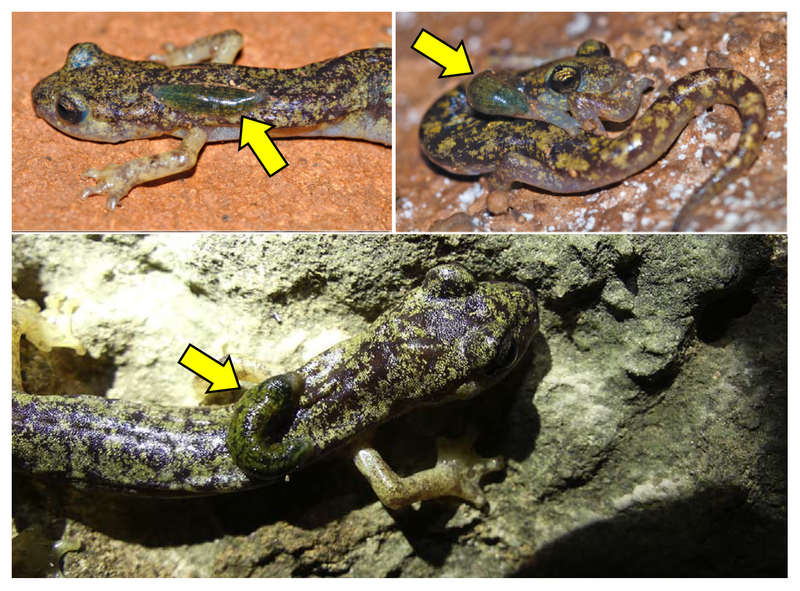 A group of researchers carried out a study of these salamanders and their leeches at various caves in Sardinia, Italy. They looked through 26 different caves and found that while some caves were leech hotspots where thirty percent of the salamanders were infected with at least a leech or two, there were other caves where leeches were scarce, and only one in a hundred salamanders had a leech. The caves that were home to lots of leeches also tend to have water with higher dissolved mineral content. While there's nothing about the mineralised water themselves that are attracting leeches, such hard water means there is active water flow through the cave network and the researchers suggested that might be how leeches are infiltrating and distribute themselves throughout the caves. They researchers found that bigger salamanders tend to get more leeches, possibly because they present a bigger and juicier target. They also noticed that whereas adult leeches tend to be found by themselves on the host, smaller leeches tend to be found in groups which might be a brood that have dropped off by an adult leech. Some leeches can be great parents, and are known to provide parental care for their brood. So those clumps of baby leeches might have been placed there by their mother to give them the best possible start in life. Infected salamanders might be doing something to compensate for being fed on by those leeches. Indeed, the researchers found that infected salamanders were more likely to be found at the cave entrance, and it is possible that was because those salamander have to spend more time looking for food. Also, it is not known if the leeches transmit blood-borne parasites (as other amphibian-feeding leeches have been recorded to) or if they alter host immunological response in some way. With amphibian populations declining all over the world due to climate change, habitat loss, pollutants, over-exploitation, and the deadly amphibian chytrid fungus, it is more important than ever to learn more about the parasites and symbionts that live on/in amphibians, and the effects that they have on their hosts. Lunghi, E., Ficetola, G. F., Mulargia, M., Cogoni, R., Veith, M., Corti, C., & Manenti, R. (2018). Batracobdella leeches, environmental features and Hydromantes salamanders. International Journal for Parasitology: Parasites and Wildlife. 7: 48-53. P.S. Speaking of leeches, earlier this year, I illustrated my own tribute to the medicinal leech in the form of another Parasite Monster Girl - meet Dr Delilah the Leech Monster Girl Doctor.